Genes and Cloning: The Science of Selective Breeding (Enhanced DVD) explores the race of not only the technology involving the use of genetic cloning, but the moral and ethical debate that continues with every development in the field. 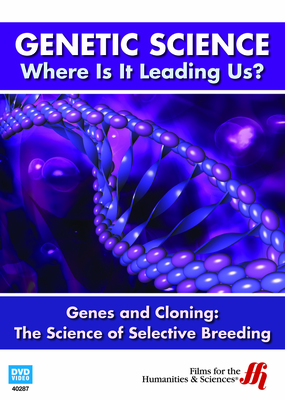 Genes and Cloning: The Science of Selective Breeding (Enhanced DVD) takes a closer look at the controversy surrounding genetic engineering and cloning. This film explores the science that drives the bio-technology field which creates not only larger-scale agriculture, but better breeding possibilities in animals, but does it also doom humankind to a future of selective "superhumans," in effect weeding out lesser desirable characteristics, in favor of those that are more beneficial? And what are the effects of genes and cloning on plants? All of this is explored in depth. Advanced concepts are illustrated with animations and other helpful graphics.